In February we celebrate different kinds of love, and we can think of no better way to do it than by reading Dreamers by Mexican author, Yuyi Morales. 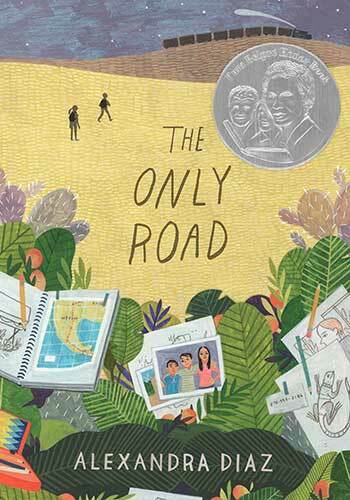 This beautiful children’s book, which is available in Spanish as well as Soñadores, tells Morales’ own history of immigrating from Xalapa, Mexico, to the United States. The book centers around a young mother and her infant son who struggle to understand the new place in which they find themselves, and the language – which they do not speak. From the first page, love of self, of family, and of language compel the characters forward. A poetic voice and striking imagery guide the reader through new beginnings and discovery. The illustrations are much like the story, captivating and bittersweet. Through the contrast of colorful drawings depicting culture and identity, over a grey and brown background, we can experience the feeling of traveling to a new, unfamiliar, and at times unwelcoming world, while carrying our own. One of Morales several gifts for her readers is that she shows us both the light and darkness embedded in immigration stories. She does not shy away from hardship and struggle, which does come with parting ways with our homes or with our country. However, Morales also draws on her own story’s resiliency and agency. Nevertheless, light emerges at the end of this metaphorical tunnel when both characters make a life changing discovery: the public library. A place where books become their guiding friends and a source of wonder. Color starts returning to the pages until it becomes prominent. Images, drawings, animals, and books share the page happily in front of mother and son enjoying the magic of a written world. The background is still brown and grey, but color becomes a protagonist. Closing the story with a message of agency and hope of having found a home and a voice in two languages. We hope that this book might encourage young readers to do just that: to relish their own stories and to speak their own truths. It is with our warmest recommendation that we encourage you to make space for this book front and center on your shelves. See this photo essay by Morales on the making of the book, courtesy of the 7-Imps blog. Citation: All the above images have been included and modified from the book Dreamers by Yuyi Morales. Saludos todos! This week we are continuing our November themes of food, and specifically its cultural importance, with another great read, El gusto del Mercado Mexicano/ A Taste of the Mexican Market, written and illustrated by Nancy Maria Grande Tabor. This wonderfully interactive book is great for celebrating food, includingthe vibrant colors of fruits and vegetables, the textures of different nuts, and the distinct shapes of different meats and fishes. It also engages kids in valuable exercises in counting, describing what they see, and learning new vocabulary on food and the different ways to prepare food. The book even won the Scientific American Young Readers Book Award for its variegated educational import. The pages are structured as a type of interactive game. The first page, for example, shows the front wall of a market with words that read, “En una visita a Mexico se pueden comer muchas comidas diferentes. Ven conmigo al Mercado mexicano. Mi canasta esta vacia y aqui tengo la lista de compras. Vamos!/ On a visit to Mexico you can eat many different foods. Come with me to the Mexican market. My basket is empty and here is the shopping list. Let’s go!” On the sides of the page readers see a long list of items to be found in the market. As the book progresses, the narration guides readers on an instructive journey through the Mexican market, addressing the young reader directly with a didactic and playful tone: “Vamos a encontrar las frutas que tenemos en nuestra lista/ Let’s find the fruits on our list.” The narration also engages readers by asking them direct questions, prompting dialogue and reflection between the reader and his/her peers, parent or teacher: “Hay frutas en el Mercado mexicano que nunca has visto?/ Does the Mexican market have any fruits you have never seen before?” Not only do these questions encourage readers to engage more with the text, they also stimulate intercultural observation, reflecting on what is new or foreign to them, what is different between the market in Mexico and the market that they are accustomed to.